Birra Tirana is named after the capital city of Albania. The beer is engaged in a huge market struggle with Korca Pils for the title of Albania's most sold beer. While Korca has better sales overseas, Birra Tirana has the best sales in Albania. This is what the locals drink so it should be a better representation of beer in Albania, so let's do this! Albania's national beer pours a slightly hazy golden colour. There is plenty of thick white head on top of the beer, which has good retention and moderate lacing. Carbonation seems minimal but it doesn't effect the head which has a good half finger layer of foam for the whole of drinking. It's a pretty nice looking lager overall, really good start! On the nose Birra Tirana has an aroma of mostly grassy hops. There's some sour grains and some good bitterness rising off the hop bed. I can also smell something almost similar to mineral water, I can't quite explain what it smells like. However this unusual nose is very short lived. This beer smells like a typical German pilsner with nice grassy hops the main protagonists, they seem quite bitter which is just the way I like them. This is a crisp easy drinking lager. The Premium Pils branding on the top of the label isn't far wrong. Grass hop bitterness dominates the palate with only minor interuptions for some interludes of grain. The carbonation gives the beer a nice tingly mouthfeel. It's as refreshing as leading macro lagers and tastes just as good. A beer that you should try if in Albania, but it's a pretty standard beer that isn't worth going out of your way to get. So is Birra Tirana an exceptional beer? No. Is it a more than serviceable local lager? Absolutely! This is never going to be one of the world's best lagers but that is not the reason it's brewed. 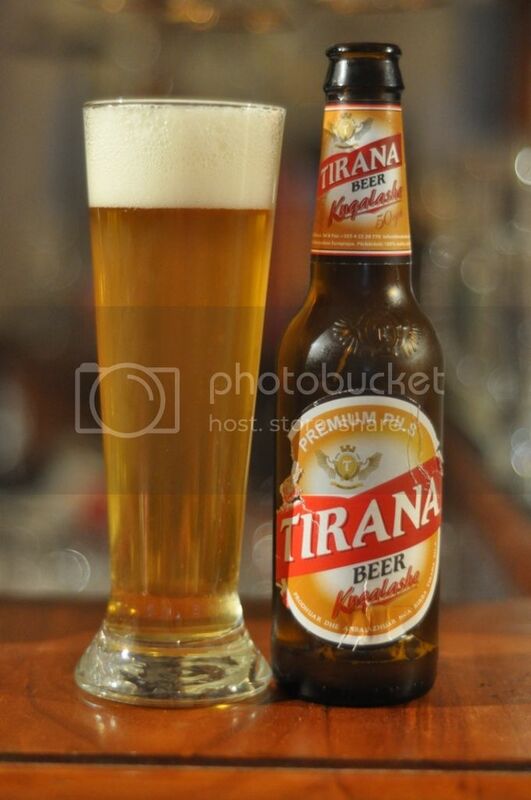 Birra Tirana is brewed for the Albanian market and it is a well balanced lager. It's clean and refreshing, if you are in Albania this is certainly a beer worth trying. You won't be disappointed if you go in with reasonable expectations. Thanks for the beer Gary, I sure as hell I didn't want to have to go to Albania to get it myself!